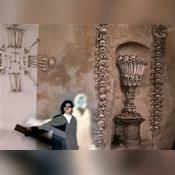 This authentic Profile Photo of r00tman for the Paranormal Hotline was taken in Kutná Hora. Being drawn to the spiritual side of life since a child, r00tman continued his development academically by earning advanced degrees in Philosophy & Religion. Of Eastern European heritage, he offers seekers insights through craft and Old World divination techniques. Operating under the pseudonym "r00tman," many have been curious as to its fourfold meaning: 1) Root is the basic cause, source, or origin of something. In his confidential sessions with seekers, he primarily uncovers the ultimate origin of the issue. 2) "Roots" as a type of Folk Magic, 3) The '00' is a reference to numerology, Sacred Geometry, and technological tools. The fourth meaning has to do with heritage and ancestor spirits. r00tman's approach is both results oriented and practical, ever guiding callers towards Good Fortune. From seemingly small issues to life-changing situations, he is here to emotionally and spiritually provide support and insights into your past, present, and future. One of the best readers i have ever come across. He is so accurate and patient i am so grateful to have found this reader. I will def be back to let you know what happens! You rock r00tman. Thank you. Have you had an experience that can only be described as paranormal? Call now if you would like to discuss things related to the following: Spirits, UFOs, Out-of-Body, Ghosts, Ancestors, Spirituality, or other related topics. Devoting my life to the development of Spiritual Technologies & Techniques, I have been offering services on Keen for nearly two decades. After performing more than 25,000 documented sessions from over three continents and 6 countries, I stand ready to assist you in matters of life, love, important decisions, & impossible odds. r00tman has been a user of Keen since 2001. Getting Psychic Mediums advice from r00tman through www.keen.com is safe, secure and confidential.